As is customary on Midtown Lunch, every Tuesday we profile a random reader to get their recommendations for the best spots to lunch near their work. 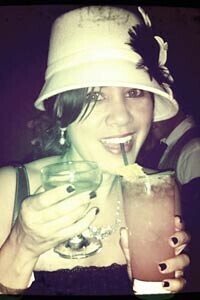 This week it’s Caroline (on Crack), a Santa Monica booze blogger looking for a tasty grilled cheese sandwich. Least Favorite Kind of Food: French, just not into the meatiness, heaviness and the tiny portions to boot. Favorite Place(s) to Eat Lunch: The chicken pho and the eggplant tofu at Tiato in the MTV building (2700 Colorado Ave), build-your-own-salad at Mrs. Winstons (3150 Ocean Park Blvd), tuna melt at Bergamot Station (2525 Michigan Ave), the ever-changing food truck alley on Pennsylvania Street (off of 26th). The Counter‘s turkey burger in a bowl with cranberries, carrot strings, mixed greens and fried onion strings with a side of roasted garlic aioli. Huckleberry Cafe (1014 Wilshire Blvd.) is a splurge for me in terms of time and money but I love the quinoa with fried egg and the salted caramel bar for a treat. “Go-To” Lunch Place You and Your Coworkers Eat at Too Often? Mrs. Winstons. So over salad, don’t care how many combinations of salad I can come up with. The farthest place you’ll drive for lunch on a normal day? On my Vespa, the farthest I’d go is Abbot Kinney in Venice — Lemonade (1661 Abbot Kinney) and Casalinda (1357 Abbot Kinney Blvd). If I walked, farthest would be Bergamot since that involves crossing Olympic, parking lots and art galleries. If you could work anywhere (just because of the lunch) where would it be and why? Waikiki Beach, just so I could get an order of Hawaiian food, probably involving Portuguese sausage and enjoy it on the beach along with my lunchtime Mai Tai. Is there anything you’d like to ask the Midtown Lunch readers in L.A.? Where can I get the best grilled cheese sandwich in Santa Monica? 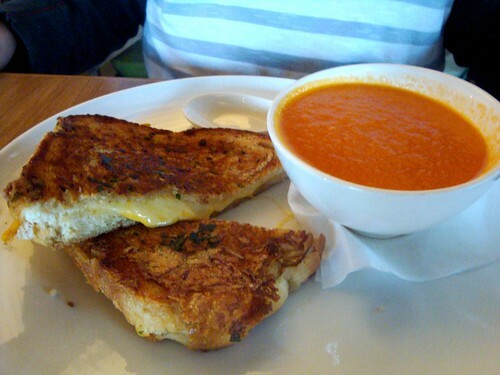 Grilled cheese and tomato soup from Tiato. Interestingly enough, Tiato makes a damn good grilled cheese (and the tomato soup that comes with it is great), as does Huckleberry- but you already know about both of those places. Have you been to Venice Beach Wines? (Wait… you’re a professional lush. Of course you have!) Their brie, grape and truffle oil sandwich isn’t a typical grilled cheese, but it’s damn tasty. Got your own suggestion for Caroline? Put it in the comments. And as always if you want to be next week’s Profiled: L.A. Lunch’er (or know somebody you’d want to nominate), email me- zach@midtownlunch.com. Posted by Zach Brooks at 11:00 am, February 22nd, 2011 under PROFILED L.A. Lunch'ers. Ha! Shows how much tunnel vision I have. I LOVE the pho and eggplant tofu at Tiato but now will def have to give that grilled cheese sandwich a try, too. Thanks! I think there’s a typo. 39 should be 29.